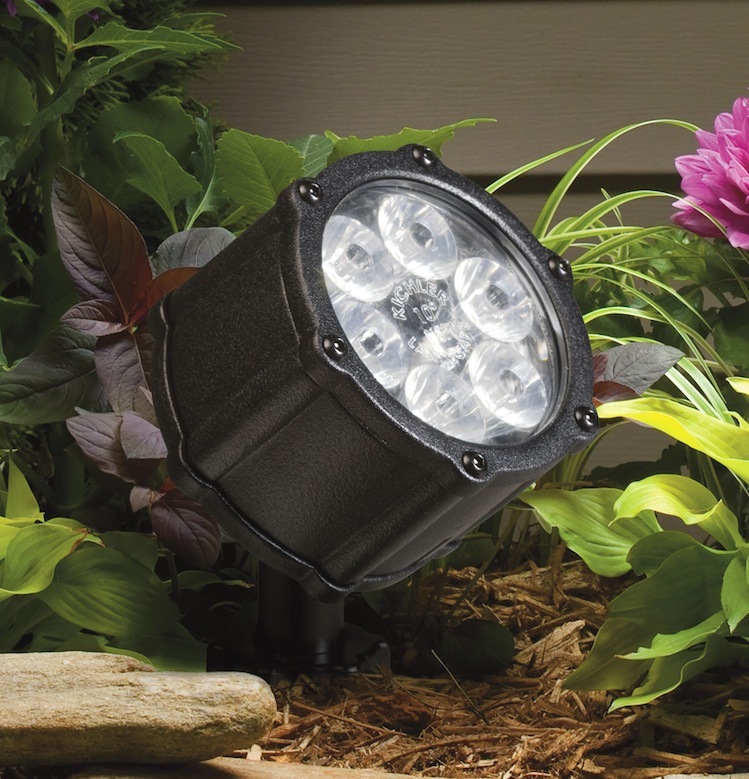 Move over halogen bulbs, the new bulbs on the block are revolutionizing the world of outdoor lighting. LEDs, the light emitting diodes that illuminate our car break lights, alarm clocks, and our household electrical appliance, are exploding into our gardens. Traditional outdoor lighting is low voltage. A cable connects a string of light fixtures to a transformer that converts household current to 12-volt direct current. LED systems use a driver rather than a transformer to regulate the electricity. Outdoor LED systems like the ones on this page from Kichler, offer both opportunities and challenges. Experts agrees that silica based LEDs are shatter resistant, a definite plus for outdoors. Cool temperatures are another plus. Incandescent bulbs generate light by heating a metal filament until it glows. Incandescent halogens can reach 500° F, according to electrical contractor and lighting design instructor Paul Bussell of Ladybug Lectric in Encinitas, California. Extreme temperatures singe leaves, branches, and fingertips. LEDs generate almost no heat, making them safe both in the landscape and to the touch. While burnt-out bulbs are a common complaint for traditional outdoor lights, LED lifespans are estimated at about 10 years, though, Bussell points out, they’ve not been used in outdoor lighting that long. Only time will tell. While Bell recommends a driver for new LED systems, he says that for retrofitted systems and those with both halogen and LED fixtures, simply use the existing transformer. Lightbulbs Unlimited also carries LED bulbs that fit into traditional halogen lighting fixtures, “You can retrofit what you have already… Still, you have to match the draw to the transformer.” And if you want to dim an LED, Bell says, use a dimmable driver. Both men agree that reduced energy use is the biggest driver for outdoor LED lighting. Bell says, for example, that a13-watt LED lamp puts out as much light as a standard 40-watt incandescent bulb. Cost, of course, is a factor. At Lightbulbs Unlimited, a normal halogen uplight may cost $9, while an LED uplight might cost $25 to $45.